Individuals who have had, or have been diagnosed with, an Acoustic Neuroma or other benign tumour affecting the cranial nerves are eligible for membership. Membership is also available to family members, friends or professionals who have an interest in the identification, presentation and treatment of Acoustic Neuromas. 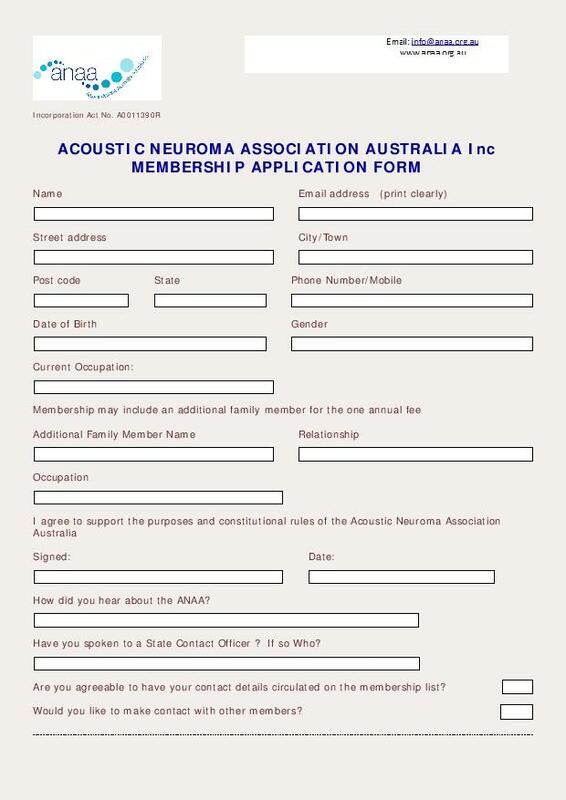 To apply for membership of the Acoustic Neuroma Association please download the membership form by clicking on the button on the right of the page. Send the completed form to the ANAA Treasurer at the address shown on the form. All members receive a quarterly newsletter reporting details of the previous meeting and advising them of forthcoming meetings, guest speakers, and other details. Contributions from members form an important part of the quality of content of the newsletter. We always endeavour to advise members of important news relating to other acoustic neuroma associations both in Australia and overseas. If you are interested in becoming a member of the Acoustic Neuroma Association Australia Inc., start by clicking on the button below. Acrobat® is the registered trademark of Adobe Systems Incorporated. All rights reserved.